Combining exquisite craftsmanship with early twentieth-century style, the new Waldorf range has been designed and produced in Europe to represent the ultimate in bathroom luxury. A combination of Eastern spirit and Western technology, Sen incorporates multiple functions in a line of independent components which can be freely combined to make a distinct style statement, further enhanced by the striking texture of the brushed anodized aluminium, available black or in reintroducted version clear-grey. Sen’s minimal design is further interpreted in the singlehole versions for washbasin, available in two eights for basinmounted mixer taps and one for a floormounted mixer. Two proposals for the bathtub: a complete modular wall-mounted system of taps and accessories, or floor-mounted as a single, bold, essential element. Sen completes and customises the shower space with a horizontal element or a vertical column, which can be combined with complementary elements dedicated to this area of well-being and regeneration. Memory blends tradition with modernity, giving a collection inspired by the past to complete and customise the contemporary bathroom. 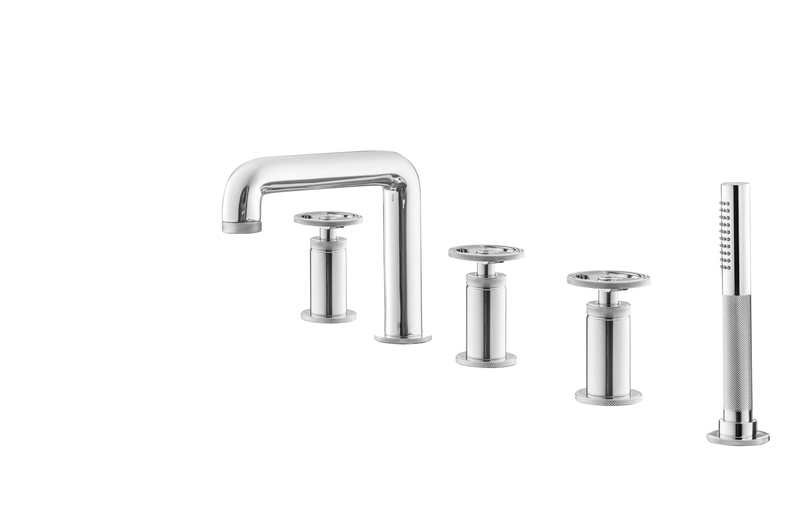 Brass tapware with natural brushed, chromed, burnished and brushed finish or painted matt white (RAL9016) or matt black (RAL9004), with characteristic cross shaped handles.